United front of center-left and left-wing parties could defeat Netanyahu, new poll shows, with 40 mandates in next Knesset. Could a grand alliance of left-wing and center-left parties deny Binyamin Netanyahu an unprecedented fifth term as prime minister? Since the Knesset voted to dissolve itself early and head to new elections, slated for April 9th, incumbent premier Binyamin Netanyahu’s Likud has led the polls with a comfortable, double-digit lead. While Netanyahu has led with an average of 29 to 30 seats in polls conducted this month, the Likud’s nearest competitors, by comparison, have averaged just 12 to 13 seats. But a new poll shows that if the center-left and left-wing parties were to form an alliance, the new list would easily defeat the Likud and would be well-positioned to form the next governing coalition. The poll, conducted by TNS Teleseker last week and published Sunday evening by Saloona, shows the Likud leading the pack with 28 seats – down from its present 30 mandates. 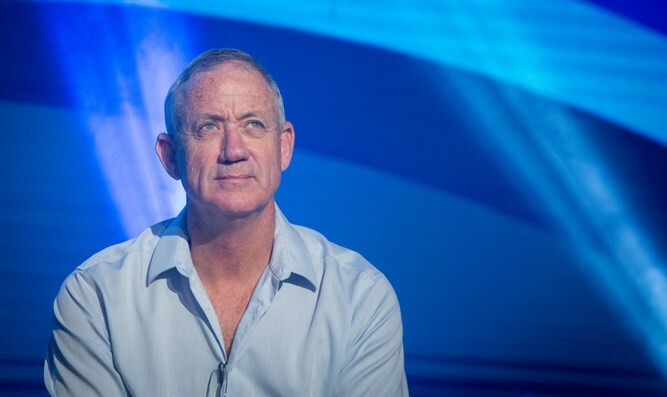 In a distant second is former IDF Chief of Staff Benny Gantz’s Israel Resilience Party (Hason Yisrael) with 15, followed by Yeshat Atid with 13 seats and the predominantly Arab Joint List and break-away Ta’al parties with a combined 12 mandates. The New Right faction of Education Minister Naftali Bennett would win nine seats, while Labor would plummet from 18 seats to just eight. Among the haredi factions, United Torah Judaism would rise if new elections were held today, growing from six mandates to seven, while Shas would fall from seven seats to five. The far-left Meretz party would win five seats, as would former Yisrael Beytenu MK Orly Levy’s new Gesher faction, and the Kulanu party. Yisrael Beytenu would sink to just four seats, barely crossing the electoral threshold, as would the Jewish Home. Tzipi Livni’s Hatnuah, formerly a partner in the Zionist Union alliance with Labor, would fail to cross the threshold. If Yesh Atid and Israel Resilience ran on a joint list along with former IDF Chief of Staff Gabby Asheknazi, however, the poll found, the alliance would defeat the Likud, winning 34 seats to just 26 for the Likud. The New Right would lose one seat in this scenario, winning eight rather than nine seats, while Labor would win seven instead of eight mandates. Kulanu would sink to four mandates, as would Gesher. Should Labor, former Defense Minister Moshe Yaalon’s Telem party, Tzipi Livni’s Hatnuah, and former premier Ehud Barak also join the grand alliance, the new list would net a whopping 40 seats. Under such a scenario, the Likud would win 29 mandates, while the Joint List and Ta’al factions would fall to just 11 seats total, the New Right would win nine seats, while Kulanu, Shas, Meretz, Yisrael Beytenu, Gesher, and the Jewish Home would win four each. Netanyahu’s current coalition partners – which now hold a combined 61 seats for a razor-thin Knesset majority – would win just 57 seats in this scenario.